Streetohome sponsored the Centre for Applied Research in Mental Health and Addiction (CARMHA) to conduct a study of ‘Publicly funded live-in addiction recovery programs in British Columbia available to homeless and formerly homeless individuals in the city of Vancouver‘. This research involved collaboration with St. Paul’s Hospital, First Nations Health Authority, Provincial Health Services Authority, Vancouver Police Department, Vancouver Coastal Health, City of Vancouver and BC Housing. The final report completed in February 2016 identified a number of challenges in the current addiction recovery system including timely access to appropriate services. Streetohome is exploring opportunities to broker and leverage two innovative promising addiction recovery pathways that will fill gaps in the addiction recovery services continuum by addressing each individual’s housing, health, legal, education and employment goals. Each pathway promotes continuing recovery self-care in the community, facilitating movement towards self-sustainability and a preferred life path. At a systems level, supports for people seeking recovery is fragmented – programs are disjointed, too short for meaningful outcomes, not easily accessible, have long wait lists, or are missing from the continuum of care. Unfortunately, many individuals fall through the cracks in between detox and recovery. 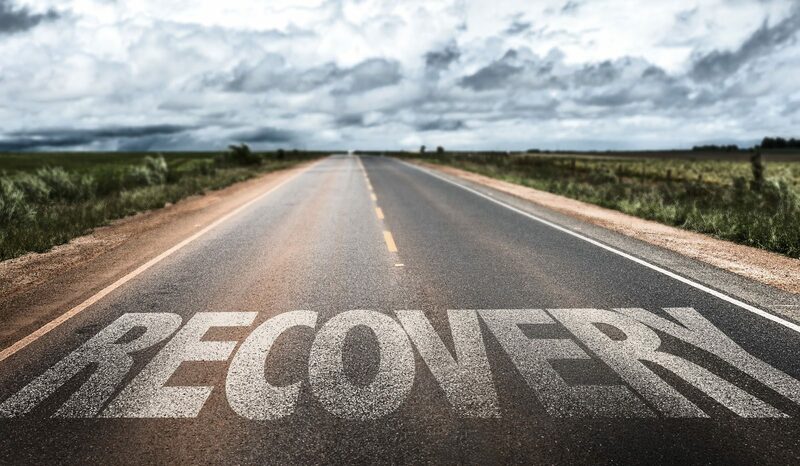 Individuals find themselves lost during their transitions between the stages of recovery that may include: withdrawal management, live-in/outpatient treatment services, recovery housing and continuing self-care with community reintegration. The current system also lacks the ability to support individuals to successfully move along their preferred life trajectories in terms of housing, health, legal, education and employment goals, during and after recovery. 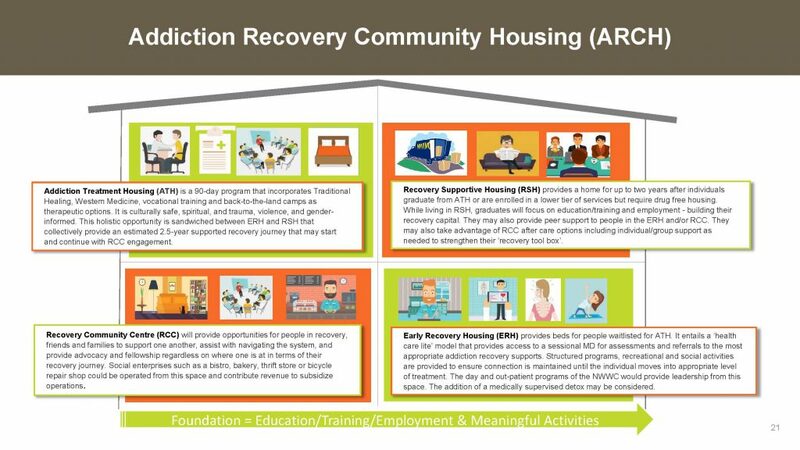 The Addiction Recovery Community Housing (ARCH) model addresses these gaps by providing a one-stop shop for a full continuum of care, including: Early Recovery Program, Treatment Housing Program, Recovery Support Housing and Recovery Community Centre (RCC). It aims to provide recovery pathways that address the housing, health and employment goals of the individual; while optimizing the use of limited and expensive health care resources; and improving access and navigation through the system. The ARCH model will (initially) be implemented in three communities to address gaps in the types and availability of supports and services. There is a need to focus on the treatment and recovery of women with babies and children, a lack of culturally safe services for Indigenous peoples in northeastern B.C., and a purpose-built RCC in the DTES to support recovery self-care, social programming, and peer leadership opportunities. These projects will address and fill these gaps in the addiction recovery services system. The Delancey Street Foundation (DSF) model combines housing with life skills development, education and employment training schools at no cost to government, families or residents. This peer-led self-help model is a long-term recovery pathway that will fill a gap in the current addictions recovery services continuum by supporting the vulnerable population transitioning out of the correctional services system. The program is sustained through the sale of goods and services delivered through vocational training schools that are staffed by residents. DSF focuses on the treatment of the “whole person” – a broad approach seeking to understand the recovery journey and addressing areas of the physical, emotional, intellectual, spiritual social and vocational needs of the individual. A whole person approach emphasizes the importance of self-help and self-motivation to improve. The peer-led model provides an opportunity for vulnerable individuals to rebuild their lives, where those with lived experience teach newcomers through the development of personal resources and belief in one’s self – an ‘each one, teach one’ model. Mutual support provided by, and to, others with similar problems provides individuals with the necessary coaching, emotional support, skill development and a safe environment to test changes – to learn how to effectively navigate the challenges of daily life.